Sunday’s fatal Pennsylvania Amtrak accident may have exposed possible blind spots in a nationwide collision prevention system that is meant to stop crashes on U.S. railroads. Amtrak last year became the first U.S. railroad to fully install “positive train control” (PTC) systems on its routes, a congressionally mandated technology that uses antennae on locomotives and sensors on tracks to monitor trains’ precise location and prevent collisions. A dilemma facing railroads is whether to spend funds expanding PTC systems to service vehicles like the backhoe involved in Sunday’s crash, or put money into upgrades of aging rail infrastructure. Officials are still investigating how the backhoe working on the tracks was struck by a Georgia-bound train in Chester, Pennsylvania, killing two construction workers and sending 35 people to hospital. It is not yet known whether the vehicle had a PTC device. Some railroads have considered installing them on maintenance equipment. It is not clear if Amtrak has done so, experts said. “If you have a vehicle that’s not riding the rails, but on the shoulder or across the rails or on rubber tires alone and you don’t allow the circuit to know you’re there, you’re outside the PTC system,” said Allan Zarembski, a professor at the University of Delaware’s College of Engineering who specializes in rail safety. The National Transportation Safety Board is investigating whether the train’s PTC system functioned properly in Sunday’s collision, a spokesman said. An Amtrak spokesman declined to answer questions about whether the railroad’s PTC system was designed to detect service vehicles on the tracks, citing the NTSB investigation. The U.S. rail industry has spent about $14 billion installing PTC equipment, though Congress last year extended the deadline for full implementation by three years to 2018. There are several varieties of PTC systems in use in the United States. 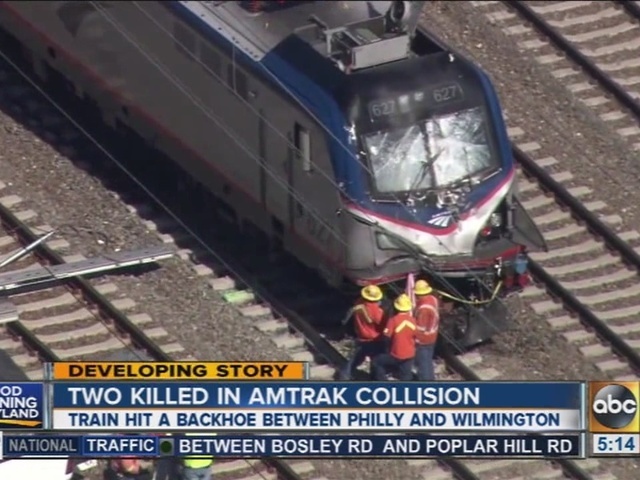 Amtrak’s is focused on controlling train speeds; development began in earnest following a 1990 incident in which one of the carrier’s trains derailed in Boston and struck a commuter train, injuring more than 400 people. Amtrak finished installing the system following a May 2015 derailment about 20 miles (30 km) north of Sunday’s crash site caused by an engineer speeding into a curve, which killed eight people and injured 43. While locomotives signal their position automatically in the PTC system, work crews need to place a device on the tracks to alert the system to their presence. Still, high-profile accidents like the recent Amtrak crashes or the February 2015 incident in which a Metro-North commuter train in suburban New York hit a car, are exceptions in an industry that has largely reduced fatal accidents, experts said. “The routine accidents have been taken care of. The rails, the wheels are safer than ever before and the people have been trained. Yet there are still mistakes that occur,” said Steven Ditmeyer, a former Federal Railroad Administration official who now works as a rail consultant. FRA data show that 15 passengers and 11 employees died in rail accidents last year, marking the deadliest year since 2008, when a Union Pacific Corp (UNP.N) train crashed into a Los Angeles MetroLink commuter train, killing 25 people. Far more people are killed by illegally crossing passenger tracks, which claimed 162 lives in 2015. For Ditmeyer, the most effective way to bring those accident numbers lower is to invest in significant maintenance and replacement on rail routes like the Northeast corridor between Washington and Boston, which has not had a major upgrade since the late 1970s. For companies, the issue is cost effectiveness, whether they should spend money on infrastructure or expand the PTC system – especially in the busy northeast. “It’s a multibillion-dollar, multiyear program to get the Northeast corridor up to full strength,” Ditmeyer said of needed upgrades.